Register for Access to Free Content. Receive 10% off when you sign up for a 2 year membership! Helping coders and managers test their coding knowledge, pursue certification, and advance in their profession. 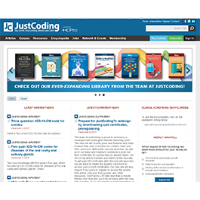 Helping coders, managers, entire teams test their coding knowledge, pursue certification, and advance in their profession, JustCoding is the continuing education destination for coding professionals. Earn at least 24 AAPC, 24 ACDIS, and 48 AHIMA credits per year! JustCoding will keep your skills sharp, test your coding knowledge, and help you stay abreast of CMS changes whether you’re working as a hospital inpatient or outpatient coder or in a physician practice. 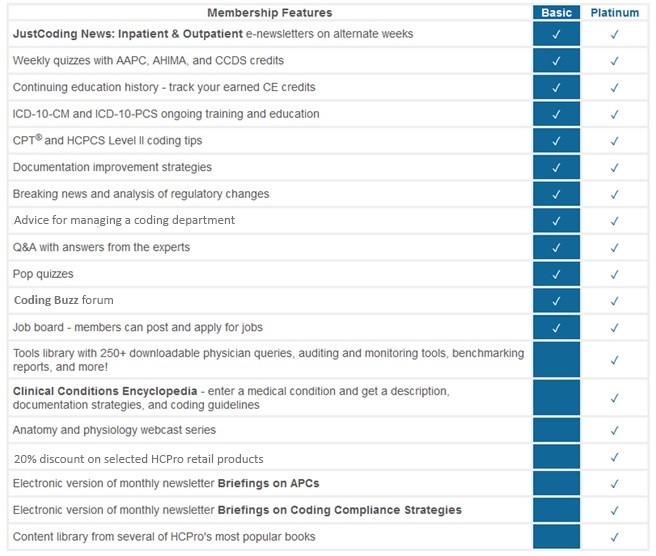 Let our team break down anatomy, terminology, documentation rules, and coding guidelines for settings that report ICD-10-CM, ICD-10-PCS, CPT®, and HCPCS codes. Check out the JustCoding website at www.JustCoding.com or or view a demo of the site here. Two membership options help you choose the access that works for you! To upgrade your current subscription, please contact us at 800-650-6787. Tools library with 250+ downloadable physician queries, auditing and monitoring tools, benchmarking reports, and more! Shannon E. McCall, RHIA, CCS, CCS-P, CPC, CPC-I, CEMC, CCDS, is the director of HIM and coding for HCPro. She oversees all of the Certified Coder Boot Camp programs. McCall developed the Certified Coder Boot Camp®—Inpatient Version, the Evaluation and Management Boot Camp™, and the HCPro ICD-10 Basics Boot Camp™; most recently, she collaborated with her team to develop the Certified Coder Boot Camp®—ICD-10-CM/PCS versions as well as the Codercise series. McCall works with hospitals, medical practices, and other healthcare providers on a wide range of coding-related custom education sessions. Peggy S. Blue, MPH, CPC, CCS-P, CEMC, is the lead instructor for the Medicare Boot Camp®—Professional Services Version as well as an instructor for the Certified Coder Boot Camp (live and online) and the Evaluation and Management Boot Camp. She also is an instructor for all of the ICD-10-CM/PCS-related educational courses (live and online). Prior to joining HCPro, Blue oversaw the development, implementation, dissemination, and reporting of information related to Medicare professional services training efforts for Highmark Medicare Services. Lisa Rae Roper, MHA, MS, CCS-P, CPC, CPC-I, has over 25 years of experience in business management, training program development, coding, and healthcare consulting. She owns an independent consulting firm where she focuses on projects in business management and training with universities, state and local health departments, specialty physician offices, hospital outpatient facilities, and surgical centers. She is a frequent speaker, author, and contributor with many nationally recognized organizations and publications.